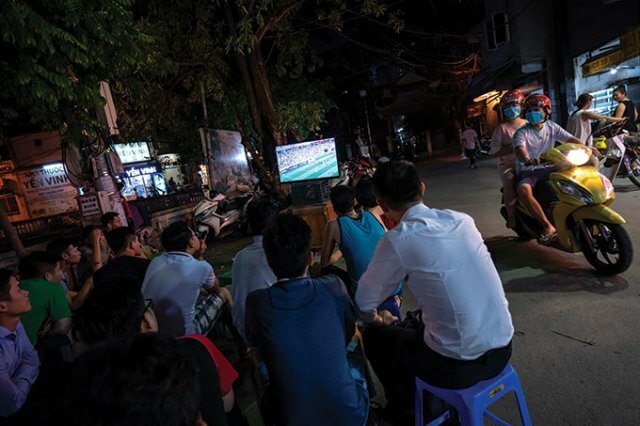 The ongoing football World Cup in Russia sees many Vietnamese re-arranging their days and sleep patterns in order to watch as many games as possible. As football stadiums around Russia burst with excitement as the latter stages of the World Cup approach, millions of fans all over the world also have pounding hearts from watching every roll of the ball. For Vietnamese fans keen not to miss any games it also comes with late nights and a change in their normal routine for a month or so. Only one World Cup has been held in Asia, in Japan and South Korea in 2002, so watching the tournament almost always involves re-arranging your work schedule if it’s in the Americas or burning the midnight oil when a European country is host. “Eating and sleeping football” becomes the norm in Vietnam when it’s the latter. After finishing work, many people, mostly men, don’t spend the evening with their family as they normally would but instead set themselves up in front the TV and spend the evening, at least, watching football. TV retailers saw a spike in sales just before the World Cup kicked off in mid-June, with many people keen to buy a better TV for the occasion. Sadly, some who need a new TV simply can’t afford it. A few days before the tournament got going, a 28-year-old man in north-central Ha Tinh province was arrested for stealing two TVs. He’s not only lost his freedom but the chance to watch games, given that TVs aren’t generally part of the furniture in Vietnamese jail cells. Football cafés, meanwhile, are doing a roaring trade. Many are packed and boast a great atmosphere during the games, staying open until the final whistle of the day, which is around 3am. Even the family home is more lively than normal, with three or even more generations getting together every evening to see who wins, loses or draws, or overperforms or underperforms. Right up until a week before the first ball was kicked, Vietnam was the only country among the 219 FIFA members not to have a broadcasting rights deal sewn up for the world’s most popular sporting event. Though millions of Vietnamese could be counted on to watch, the price for the rights was well beyond the budget of the national broadcaster, VTV. The cost has headed ever upwards over the last decade, from $2 million in 2006 to $3.5 million in 2010 and $7 million in 2014. VTV eventually did secure the rights just days before the tournament started but is yet to reveal how much it paid. It did get some help, however. Local conglomerate Vingroup chipped in $5 million for VTV to secure the rights, knowing how much it means to football lovers around the country and keen do its part, according to Vice Chairman Mr. Nguyen Viet Quang. The love for football in Vietnam was there for all to see just a few short months ago, when the men’s U/23 team surprised even their own compatriots to make history at the U/23 Asia Cup, being the first from Southeast Asia to go further than the quarter-finals. They did an incredible job in beating stronger teams such as Iraq and Qatar and eventually made it to the final, where they went down to Uzbekistan with just seconds left on the clock before the lottery of a penalty shoot-out. Streets in cities, towns, and villages swarmed with people out celebrating as Vietnam progressed. Young and old alike banged on pots and pans and big plastic bottles on streets blanketed with Vietnamese flags, with horns blaring and chants of “Vietnam vo dich” (Vietnam the Champions). Though falling short in the final, the team returned home to a hero’s welcome. Roads from Hanoi’s Noi Bai International Airport to the city center were flooded with enthusiastic fans waving the national flag, with the normal 40-minute trip taking five hours. Some older people said that they have not seen so many national flags in Hanoi since the French were defeated in 1954 and the US in 1975, not in football but in war. Haggard faces in the morning and yawns throughout the day always reveal who stayed up until 3am watching the late game at the World Cup. “Sick days” have been common at many workplaces, as has time off for “urgent personal business”, though no one is fooled. “One morning I asked my boss for the day off because I felt sick, and he replied by asking whether I’d caught a cold from watching the football,” laughed Mr. Minh Tuan, who works in IT, before adding that his boss approved but warned him to not to ask again. Some re-arrange their whole day. Salesman Mr. Tran Thanh goes to bed as soon as he gets home, so he can watch all the games and still be in reasonable shape at work the next day. He even skips dinner if that’s what it takes. It’s sometimes even more serious for couples dating. Some boyfriends have been given a “red card” from their girlfriend, accompanied by threats of ending the relationship. FIFA recently approved an expansion of the World Cup, from 32 to 48 teams, with 16 groups of three teams, in 2026, when the US, Canada and Mexico are co-hosts. There’s even been talk of this being brought forward to the 2022 tournament in Qatar. This throws open the possibility of Vietnam qualifying for the first time, given the U/23 team will be at their best in four years’ time. If that happens, there’ll be many sleepless nights not only watching the games but also celebrating Vietnam’s first appearance on the biggest stage of all.